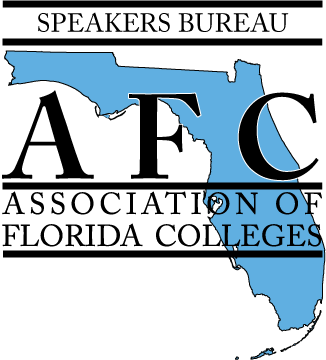 The Association of Florida Colleges (AFC) Speakers Bureau brings you educated and motivational subject matter experts, business speakers and keynote presenters. If you’re looking for cutting edge education or leadership speakers who will inspire your commission, region, or chapter groups, college or campus employees, or to engage a crowd, the AFC Speakers Bureau has you covered. We represent the Florida College System members of the Association of Florida Colleges most sought-after speakers. Speakers present on a variety of topics that are sure to meet your professional development and entertainment needs. Experienced speakers are able to offer valuable insights and fresh ideas that contribute to the overall success of your event. They will wow your audience and elevate your programs to the next level. View our list of vetted qualified speakers to find the perfect person for your event. The Speakers Bureau connects audiences with speakers who can knowledgeably and dynamically present topics relevant to Florida colleges. In addition, speakers introduce and promote AFC and its educational and professional goals to their audiences. AFC greatly appreciates speakers' contributions toward the achievement of our goals and in expanding AFC outreach.